The Spy Kids are back! 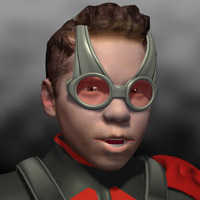 In the computer game Spy Kids 3-D: Game Over Juni and Arnold battle it out in virtual space in an effort to free themselves from the virtual machine. From Miramax, Markus received partially rigged, poly mesh models and some texture maps for the Juni and Arnold actors. Markus finished the modeling, rigging and texturing to complete the characters for use by the animation team at Inlight Entertainment for creating cut scenes and game sprite animations. Shown at left are some fight moves which Markus created as game sprites for the Spy Kids 3-D: Game Over game. One of the things the models lacked were facial texture maps, so Markus created textures from photos of the actors taken from film clips and candid shots on set! The clip below is the end game scene. Markus animated the entire scene, including the lighting and particle effects.